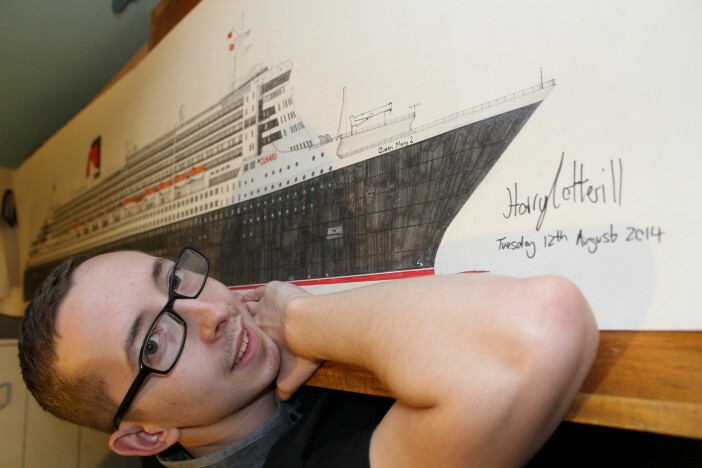 You might have seen his highly detailed drawings of cruise ships on Twitter or his site, Cruise Cotterill, or even seen him aboard a cruise off the south coast of the UK; now Harry Cotterill has been kind enough to answer a few questions about his passion for cruise ships, drawing and what he reckons will happen in the future of the industry. Hi Harry! Where in the world are you right now? Right now I am in my office and drawing room, in the house which I live with my parents in Colchester. You can normally find me here working away, often working on one of my many drawings or arranging ship visits and cruises. If I am not here I am probably visiting a ship somewhere or enjoying a cruise! What inspired your love for cruise ships? The best ship you’ve ever sailed aboard? For me it has got to be Queen Mary 2! There is no other ship like her and of course she kick-started my love of cruise ships and was the first ship I ever stepped aboard. She was also the first ship I ever cruised on. In 2010 a group of my fans kindly got in touch with my parents and surprised me with a 2 night cruise on QM2. Although she might not have many of the innovations and gadgets that we see on many of the newest cruise ships, even today I still love QM2 and her elegance and magnificent style. Her sheer size is still just as impressive, even if she is no longer the biggest cruise ship in the world. Which out-of-service cruise ship do you wish you’d been able to sail aboard? As I love QM2 so much it would have to be the ship she replaced, Queen Elizabeth 2. I was lucky enough to watch QE2 sail from Southampton a number of times before her final cruise in November 2008, but never got to visit the ship, which is something I really regret not trying harder to arrange. Anthem of the Seas or Britannia – which excites you the most? That’s a tough one and I couldn’t pick. Both ships are really amazing and it is fantastic to have two ships like this based in Southampton this year. I have not yet had the chance to visit or cruise aboard either of them yet, but hope to visit them both during the summer in Southampton. How long does the average ship drawing take you? On average a drawing takes around 30 hours, however it really depends on the size of ship I am drawing, the scale I am drawing it on and how complex its design is. For example any that have hull art, like Norwegian Cruise Line or AIDA ship can take in excess of 50 hours. If you could take any role in a cruise ship crew – which would you take? It would have to be Captain… wouldn’t it!? Just think how amazing it would be to be Captain of a magnificent cruise ship. With such a high ranking position would of course comes a lot of responsibility though! Following bionic bartenders and skydive simulators – what technological advance would you like to see come to the next generation of cruise ships? In recent years we have seen more and more giant TV screens and interactive technology aboard cruise ships, including 4D cinemas. Carnival Vista which sets sail next year will be the first ship to have an IMAX cinema. I would really love to see a 360 degree cinema incorporated into the design of a cruise ship. What about a revolving restaurant at the top of the ship? Alongside my love of ships I also find astronomy really fascinating, so maybe an observatory for looking at the stars on sea days late at night after dinner. What would be your perfect 7 night cruise itinerary? That’s another tough one! If we were to be realistic, it would have to be a cruise which didn’t involve flying, as I haven’t yet ever stepped foot on an aircraft. So if we were to sail from Southampton it would have to be a 7 night cruise to Norway. I’ve always wanted to see the beautiful Norwegian Fjords and have always been very jealous of my friends who have been there. If flying wasn’t a problem it would probably have to be the Panama Canal. 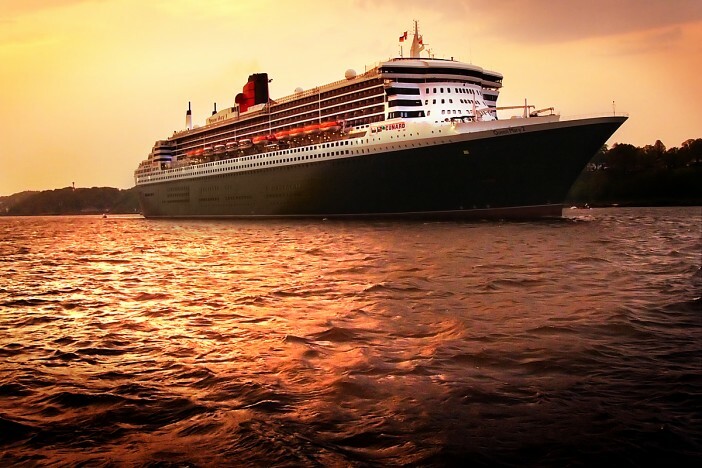 My best holiday experience would have to be my 5 night voyage aboard Queen Mary 2 in June 2012 with my Dad. The voyage departed from Southampton in true style, as all Three Cunard Queens set sail together to mark the Diamond Jubilee. The next day I celebrated my 18th Birthday on board, sailing in the English Channel on route to Rotterdam. Just before noon I was invited to the bridge where I got to sound the ship’s whistle. This was something I had always wanted to do and to get to do it aboard my favourite ship was really exciting. That night I was also presented with an amazing Birthday cake in the shape of the ship! One last question. do you have a favourite ship drawing that you’ve made so far? Images sourced via Harry Cotterill, Wikipedia Creative Commons, Royal Caribbean Press Center, Flickr Creative Commons. Credits: stereotyp-0815, Nige Brown.